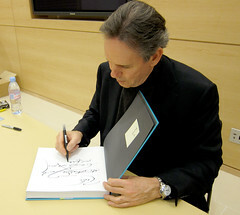 Chef Thomas Keller is on his book tour to promote Ad Hoc At Home. Traditionally, Monday is a slow night in the restaurant business and so becomes the defacto night off for many. For the few kitchens open, I suspect they had the bare minimum of staff present last night – as most were congregated at the Toronto Reference Library. 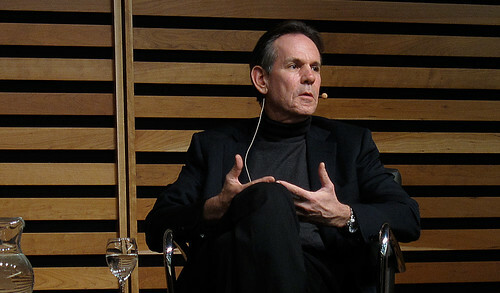 And this is because of Thomas Keller, a man who one friend calls “the best chef in the world.” This is a statement I wouldn’t challenge in a room of more than 450 people – from food enthusiasts to professional chefs – all interested in hearing from someone whose precision in the kitchen propelled his restaurants to the top. Though Keller is on his book tour for Ad Hoc at Home, the room was less interested about the fat volume of recipes clutched in-hand and more focused on the tall man walking down the centre aisle. Keller looked a bit uncomfortable as he folded himself into the modern black leather chair on stage. Seated opposite was our host for the evening, Allison Fryer of the Cookbook Store, who began with a quick run-down of Keller’s accomplishments, citing his restaurants and accompanying Michelin stars. Summary completed, Allison turned to her guest, who was busy with his phone taking shots of the crowd from the stage. While Keller is no stranger to the necessary book-tour circuit, even he seemed somewhat taken aback by the massive turnout. He commented that he was scared to death in front of all these people and followed with where he’s most comfortable – behind the stove. Keller has long days on a non-stop book tour and thanked the student volunteers for helping him get through signing 400 600 books that afternoon. There was an additional thanks to a Mr. Efficiency, in what I now think might have been a shout out to Mark McEwan, loitering at the back of the hall. But I speculate, only. As the questions begin, he talked about the basics of a being a good cook and of liberation in repetition. How, as you get better and better at an action, it becomes automatic, freeing you to think ahead to the next step in your meal. He also spoke of how he learned the importance of writing recipes down early-on and of not getting lost in the spontaneity of cooking. Keller speaks casually, but emphatically, about the sustainability and locality of ingredients. Walking in Pusateri‘s earlier that day, he scolded a woman (in actuality or just mentally, I’m not sure) for buying peaches that were dehydrated and non-aromatic – clearly not local – and pointed out the fact that there were 12 varieties of beautiful apples from Ontario farms in the next display. On his way out, he later spied the same woman blithely selecting (Chilean?) cherries, adding to the offense. He also berated his host for enjoying blueberry muffins out-of-season and advocated using dried berries instead (note: frozen wasn’t acceptable apparently). All this, a little hard for the Toronto audience to relate to, given that our northern region does not lend itself to the “seasonality” Keller celebrates in his Californian clime. But this is Keller and his mantra of buying the best ingredients, and the premium that goes along with it is just part of that philosophy. He speaks about going to your supplier and demanding the best, but also refusing to buy out-of-season produce. To illustrate the almost over-the-top quest-for-the-best, this is the man who opened Bouchon Bakery in Yountville to improve the quality of bread served at his restaurants (not complaining!). But then there’s this almost playful and seemingly spontaneous aspect of Keller, the man who opened Bouchon simply because he wanted somewhere to eat after service at The French Laundry. At the end of the day, Keller said he’s a sentimentalist and that it’s about the memories. One of the questions from the audience was actually a request – for Keller to tell “The Cone” story. This is the genesis of one of his signature dishes of a salmon tartare (easy and fabulous recipe) and cornet (not so easy) appetizer. I got caught up in listening, so you only get to see the last bit of the telling. Thomas Keller is an amazing chef and my meal at The French Laundry was a turning point in dining for me. I wish I had had the foresight to bring the menu I have stashed carefully away for him to sign. I made do with the book under my arm that I had nearly forgotten about. Though Ad Hoc At Home was the reason Keller was even in town, it was almost as if it were an addendum to his visit. While he couldn’t stay long, the audience made it plain that he was welcome back to Toronto any time he wished. ack! I missed out on this!